1. bright blue in color, like a cloudless sky. Azura is a 1967 Grampian Classic 31 Ketch. This particular sailboat was also available as a cutter and sloop. What is a ketch, you ask? The name refers how the sails are rigged—a ketch is two-masted with both a main sail and a mizzen. You can read more in the article What’s in a Rig? The Ketch. Grampian Marine was based in Oakville, ON from 1962 until it closed it’s doors in 1977. The company made many sailboats for US Yachts to be delivered to the Canadian market and then eventually started designing their own vessels. 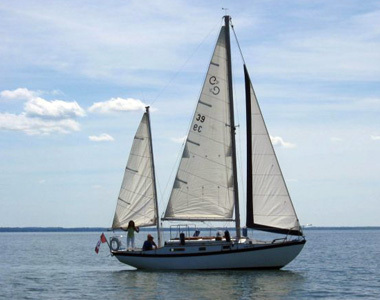 The Classic 31 was designed by a naval architect from Annapolis, MD named Peter van Dine. After looking at several sloops we came across an advertisement for a ketch. Bryan and I were intrigued so we went to have a look. After a thorough inspection and reviewing a recent survey we put in an offer to purchase the Azura. Renee had owned the sailboat since 2004 but had decided to upgrade to a larger vessel… another Grampian. You could tell that she loved Azura because of the great shape the boat is for its age. She also told us that at one time the sailboat had been called the Moyie—perhaps it had been named after the SS Moyie. On April 7th, 2017 SV Azura was transported overland from Lake Simcoe to Port Dalhousie. It was quite an adventure and you can read more about it in Moving A Sailboat. One of the things we enjoy about Azura is her uniqueness. There are not very many Classic 31s around anymore and even fewer setup as a ketch. We’ve noticed that people are quite curious about her and we often have people stop to ask questions when we are docked. Many comment that she has “beautiful lines” and we certainly agree. Azura is a well-outfitted boat and the perfect size for our family of four. It has some great vintage details and quite a few upgrades. Even though the sailboat has been fairly well maintained, there were a few things that needed immediate attention. We’ve also replaced a few things and given Azura our own personal touches. 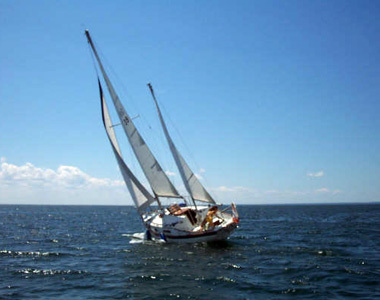 Of course, we’ll be sharing that part of the adventure with our readers as our sailing life progresses. These photos are courtesy of Azura’s former Captain, Renee L. During the 2017 sailing season we will update these with our own images.